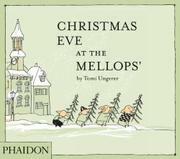 The Mellops family of pigs prepares for Christmas in this delightfully droll fable about the importance of giving to others at Christmastime. On Christmas Eve, the four Mellops brothers, Casimir, Isidor, Felix and Ferdinand, each try to surprise their father with a small, decorated Christmas tree. Their wise parent sends them out into the snowy night to give the trees away to those less fortunate. After trying several places that already have perfectly fine trees, the porcine brothers discover a houseful of lonely, needy pigs who happily accept the trees and other gifts of food and clothing provided by the kind Mellops brothers. The piglets return home to celebrate Christmas Eve with their parents, enjoying their own presents, tree and dinner, but the satisfaction of their genuine charity sets the tone for their happy holiday. The understated story, first published in England 50 years ago, has a French flavor in the quietly humorous text and minimalist illustrations in a sophisticated palette of peach and spring green. Ungerer, winner of the Hans Christian Andersen Prize, exhibits a masterful sense of pacing in his work, with plentiful space surrounding his witty piglets and a spare text conveying a complete, satisfying plot.